'Alright...' Spike thought to himself. Big Mac's arrival changed things up a bit for the worry ridden dragon. 'If Big Mac can handle dressing up all girly like. So can I! He's the manliest stallion I know! Maybe Valen's right, if I just stop caring so much, it'll be fine...yeah.' Tonight would be a lot more fun if he wasn't so worried. Besides, he had to look at the bright side for this! At least the outfit was super comfy and it didn't clash with his scales and it fit like a dream, what could he really complain about? He could worry about fixing the mess that caused this later. For tonight there were treats and snacks to be had! And speaking of treats, Berry Punch had just begun the demonstration of her latest invention. Spike hadn't really pegged the mare for a candy maker, but with as much wine and juice she made, he wasn't terribly surprised that she'd take a little foray into the wide world of sweet treats. It was some mix of a juice box and a gooey candy...Which frankly was brilliant! Sure the gummies that had the liquid center was great, but having a straight from the tap source of that goo? That was awesome! "Wow Berry, those are really cool. I bet you could make loads off them!" he said once she had finished her demonstration and deposited one in his trick or treat bag. Having a snack in a juice box like that was brilliant for kids and ponies with a sweet tooth on the go...What next? Yoghurt in a tube? Alright! First trick or treat stop successful. Sure it wasn't the biggest haul from a house, but hey! A start's a start and Spike even managed to resist going ahead and devouring this one. Chomp went the last bite of that delicious candy apple. Man Nightmare Night was the best. When else could someone pig out on candy? Any other time of year, everyone would be all 'Noooo, too much sugar! Don't, think of the cavities!' and things like that. Meandering over to Big Mac's side, Spike idly chewed on the candy apple's stick with a smile. "Awesome costume Big Mac, did you make it yourself?" Spike asked the stallion before giving a little tug to the chest of his own. "I think you were super distracted at least week's OnO game. You remember that weird idol? I grabbed it and it did this. But apparently... he glanced over at Discord. "Because I left the game early it's stuck on me outside of the game now." sighing, Spike rolled the stick from one side to the other. "But hey! It looks good, right? Hawke had to admit that the ranch pretty impressive. She couldn't think of a time she had seen more tomato plants all in one place. When ponies cultivated, that didn't do it half way that's for sure. Applejack's and Boulder's places were sure signs of that. Boulder's little brother, who if the griffon recalled right from the finish line was named Rocky, was the quickest on the draw to greet Hawke. Yup, just as much southern hospitality and pride as his older brother. The griffoness smiled in kind and gave Rocky a wink. "Well thank you, handsome, I bet I will if everything tastes as good as it smells!" The race had really worked up an appetite, which could make most anything smell good to be honest, but it wasn't an exaggeration to say the food smelt heavenly. She could hardly wait to dig in! Before she could do that though, the ever pretty pink party pony had slipped out from wherever she was hiding and slid up next to her. Hawke purred a let her tail wrap around one of Pinkie's hind legs as she gave her a hug. "Well with you here, how could I miss it? Plus, smell all that food! If I'm not careful I may end up loosing my racing figure!" she chuckled and gave her stomach a pat. Just from smell alone she felt like she was going to pack on a few pounds. It'd be extra laps tomorrow that was for sure! With a half gagged 'ack! ', Spike was pulled into an 'encouraging' hold by Valen. It was a nice sentiment and all, and it wasn't like the colt was wrong, if anything Spike knew deep down he was right, if it wasn't for one teensy fact. "Maybe they'll forget about it for tonight, but this thing has been stuck on me for a week already!" he gave the chest of the dress a little tug, it snapping back into place. It was easy for Valen to do, he was used to this sissy frufru stuff, but not Spike! The only thing that got him into things like this was if he was helping Rarity! And even then he wasn't the biggest fan...but aaah Rarity~ "I'll try...no promises. Turning to Yama the little dragon chuckled and sighed. "Wouldn't be much of a curse if I could just give it to you, but believe you me, I would if I could." Not long after Discord's explanation of tonight's plan, a voice cut the stillness that followed. A very, very loud voice. And that loud yell sounded familiar...Oh no...Was that? Oh no it was. Wind Walker was here. Again this wasn't a case of displeasure at the filly's arrival. No, this was Spike's shame and panic riddled brain running through the absolute worst case scenario of her showing up. Wind Walker was friends with the Crusaders. The Crusaders had connections with the school's newspaper. This greatly increased the chances that Spike could end up in the newspaper like this!! He internally screamed and the urge to just hide in the still girly but not nearly as horrible burlap sack was rising with every passing moment...And now his ears were ringing too! Guh! "Hey...Wind Walker. Happy Nightmare Night to you too. Nice costume!" here was hoping she'd not keep up the Royal Canterlot Voice all night. There'd be way to much attention drawn their way and that's the LAST thing that Spike needed for his mental health... "So Discord, exactly how many treats are we supposed to gather up for this 'Ghoul' anyway?" it stood to reason that if you got more than your weight in candy for trick or treating, turning it in just to get a statue the size of you made out of chocolate, you'd be downgrading...unless it was just really, really good chocolate. Which would make sense if it was so legendary!...And if it existed at all. Another yell broke through the conversation once again. Thankfully this one wasn't right in his ears like Wind's conversation with Valen, yeesh. What did tinnitus feel like? Discord had the right idea, a candy booth seemed like a great start! Spike followed along with the group over. A cute stallion that Spike couldn't recall seeing before had set up quite the cart with all kinds of tasty treats if the smell in the air was anything to go by. Before anypony else could really say anything, Wind Walker asked what was obviously on everpony's mind. Just what sorts of delectable snacks did the stallion have? While they had made their way over to the cart, it seemed another filly had found the ruckus and a desire to join in. Just how many more strangers were going to end up seeing Spike like this?! At least Rainbow Dash or Pinkie Pie weren't around to see this, he'd never hear the end of it! "Eheh, sure! The more the merrier! I'm Spike, what's your name?" it's not like Spike would say no, that would be rude! Even if he did look ridiculous, he couldn't just shoo anyone away. Still...tonight was only going to get more stressful. Can you die from embarrassment? What did dying feel like? Spike was pretty sure that he was going to die from embarrassment before the night was over. What would they put his grave? 'Here Lies Spike. What the heck was he wearing?'. Maybe if he was careful he could just slip back inside and wait the night out. Before he could contemplate his sweet escape any further than taking a step, an unfamiliar voice broke the silence and nearly scared the little dragon's bones out of his skin! Thankfully it only toppled him over, clutching his chest in surprise as the mare talked a million miles a minute. Was she a distant relative of Pinkie Pie's? Catching his breath from the impromptu terror, Spike got back up to his paws and dusted off the hem of his skirt...groaning afterwards as he realized what he was doing. Stupid girly outfit...Well he knew sooner or later that he'd have to deal with socializing in this thing..."Uhh, nice to meet you. I'm Spike. Sure you can join in, there's plenty of candy to go around I'm sure!" at the compliment to his outfit though the dragon looked down and groaned again. "Thanks, I hate it...I uh...left a game too soon and now I'm stuck in it. I hope it's not forever." rubbing his face, Spike's shoulders slumped. Remember Spike, it's for the candy. It's for the candy. Let's hope Rarity doesn't see him like this. While still waiting on Discord to arrive, another voice had chimed in. This one was both thankfully, and sadly, familiar. It wasn't that he didn't like Valen! Valen was cool. It was the fact that if more ponies he knew saw him like this, the more it could spread he was wearing it to begin with! Starlight's idea of helping Spike through the night was...what exactly? To have Valen be in a girlier outfit than him? Well, they were about equally girly, but Valen did this kind of stuff for Rarity a lot! "Hey Valen...thanks..." he just wasn't going to escape this un-embarrassed was he? Was everypony going to comment on this stupid getup? "This is Yamakara, they're from Neighpon. They're going to be joining our trick or treating. We've just gotta wait on Discord to show up. He's probably going to be fashionably late." 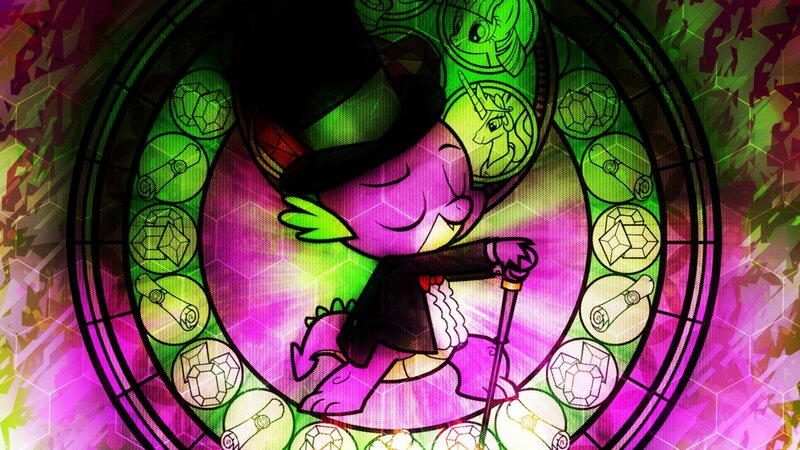 Spike chuckled and folded his arms. You can't rush a chaos spirit, Spike knew better...But still, he hoped that the noodly nerd would get here soon, before the crowd grew and Spike be confused for a tomato with how hard he'd be blushing. Thankfully, no sooner thought than done, Discord arrived in typically chaotic fashion. No wonder it took the draconequus so long to show up, he was making Trick or Treat bags for them!...But...how did he have ones made for Valen and the new arrival? HOW DOES HE DO THIS. Urgh, whatever, at least Spike wouldn't have to deal with the pretty fru fru bag that Discord gave him earlier. However as soon Spike took the offered potato sack in his claws, there was a comically large puff of magic around it, and the sack had changed. It was still very much a potato sack, but now matched quite well with the pretty pretty costume. Even the dragon on the front of it was in a matching outfit. Spike promptly stuck his head into the sack and let out a frustrated scream as Discord went on to explain tonight's itinerary of sorts. Do it for the candy, Spike. Discord had used the story of The Ghoul to lure him out to begin with. The story sounded super farfetched! Candy the size of yourself? I mean that made sense, but some magical house that appears at the Everfree? That...Okay now Spike couldn't lie, he's seen stranger. And that part of him wanted to believe, who wouldn't want a free sculpture of themselves made out of chocolate? With his frustration all screamed out for the time being, Spike withdrew his head from the pink and blue sack with a sigh. It was going to be a very, very long Nightmare Night, and there was no time like the present to get started...the sooner it started the sooner it was over and Spike could hide and gorge himself on candy until this whole cursed costume thing blew over. "Alright so we've got a course of action. Let's go go go. What's the first step, Discord?" Spike said as he moved behind the other three to try and start pushing them onwards. Before Hawke arrived for the party, the young griffoness had a few things to take care of first and foremost. Okay one thing really. After the race's ceremony was over, it officially meant that she could get out of that wing binder and cruise again. She would use that time to take off and get a birds eye view of the course they had just ran. The aerial view of it was pretty to be sure, but you did lose a bit of the grandeur that came from running through an autumn field. For about an hour or so Hawke zipped and zoomed around Ponyville to stretch her wings and get out some of the pent up energy that she couldn't really scratch during the race. Once that was over however, Hawke had a party to attend! With how fast she was flying, it was easier to hear her coming before seeing her coming. The tell tale sound of high speeds would herald Hakwes arrival. Swooping in low the griffoness rushed past trees and rocks and with a dramatic loop before the end would land at the entrance with a dramatic flair and a smile. "Phew, sorry it took me so long to get here. Had to give the wings a little stretch after the race." she wiggled her wings before folding them back against her body. "Man it smells really great out this way!" all it took was a quick little sniff at the air to set her stomach to growling. Sure Equestrian cuisine may not be the typical Aquellian fare, but it was still delicious and filling. But the best part was, most Equestrian food she had was homecooked, which meant it was fixed with care, rather than some of the slapped together meals one could get at a fastfood joint. Hawke arched a feathered brow, so the hunky kirin wasn't a kirin at all but an...Okami? The griffon wracked her brain for a few moments as she tried to recall where exactly she had heard that term before. Wait, duh. Ravencrest's books! Okami were a type of yokai, but yokai weren't usually so forthcoming with their yokai-ness, were they? Maybe Taira here was an outlier? Whatever the case may be, it didn't change who the stal...er...wolf was. Hawke smiled and wandered over to Pinkie's side to get a better look at her acquaintance now that his disguise had fallen. "Can pack a lot of wolf in that kirin disguise of yours huh? Man oh man, creatures must get cricks in their necks staring up to talk at you." she playfully teased. She expected the race to be full of surprises, but more so in the way of who would win and lose or leads being exchanged, etctera. Not one of the competitors turning out to be an almost mythological creature. Still, it was nice to see she wasn't the only one hiding who they were. Even if it was for entirely different reasons. Chuckling she gently poked Pinkie in the side with an elbow. "Congratulations by the way Pinkie. You really pulled it off back there! We'll definitely have to race together again sometime. Of course, that'd have to wait until after our date." she gave Pinkie a wink before turning her attention back to Taira. "And congratz to you too! Had a debate going in my head who was going to win between you and Applejack for that last stretch back there." Fifth place! Okay. Hawke could live with that. Third would have been fantastic, she'd have felt a lot more pride in her accomplishment then fifth, but at least she placed. Not to mention the fact she was the only griffon that placed! That actually did mean a lot. Well to her anyway, she wasn't sure how any ponies here felt about it. Though a lot of hometown griffons would probably just scoff at the idea of being in a race against ponies, let alone getting fifth place in a competition. Most races, not even third place got anything. Hawke bowed her head down as the Mayor placed the gorgeous wooden medal around her neck before raising back up with a smile. "Thank you ma'am, I'm honoured." Hawke was hardly surprised at the other medalists who placed ahead of her. While Boulder Dash could have certainly pushed ahead into the lead, Pinkie Pie managed to beat him out with her last burst of speed. And Taira and Applejack? Well as she expected, it had came down to those two, but it seems this time the farm pony had came out on top! Hawke was thankful she pushed herself as hard as she could in the last few moments. It had given her enough time to bury those negative thoughts and memories away for another time. Today was a time to celebrate! The race was done, she placed, the cute mare she was going on a date with later placed, there was going to be a party or two! What wasn't to like? Consideration on that was cut short however by the sound of a colossal sneeze rocking the area. A large wave of mist exploding out around from Taira...Poor guy would have to get his allergies in check, surely there was some kind of medicine that...would...What? Where the kirin once stood was a huge, like HUGE wolf. Same colours, same medal, yeah that was Taira but what was Taira?! Hawke's jaw dropped in shock and confusion as she watched the wolf huff and sniffle and sneeze..."So...everyone sees this right? It's not exhaustion from the race making me hallucinate, is it?..." Uggggh. Okay, Hawke was hating this. This kind of thing happened from time to time. Self-doubt and frustrations were harder than feelings of the past to escape when running at times. It didn't help she skipped breakfast this morning either. She stared up ahead towards the finish line. Towards everyone ahead of her. There wasn't even a chance of winning at this point was there? Taira and Applejack were, as everyone could see, the favourites to win. Having been neck and neck throughout most of the event. Boulder could certainly make this an upset, and even Pinkie was further ahead than she was at this point, she could pull it off as well. Hawke still stood firmly by the idea that winning wasn't everything, but it still felt nice to feel like you had a chance. And at this point that was feeling slim to none. She pumped her legs as fast as she possibly could, but there'd be no real chance of catching up. She felt so much slower on land, she hated that feeling. She hated the feeling that it didn't even matter if she could move faster, it felt moot to just keep moving when her position in the race felt as solid as stone. Still though she would try. It'd be easier to just say 'Forget it' and just walk the rest of it off. Giving up was so easy! That's why she couldn't. Hawke Dreamcrest wasn't legendary for giving up, she was legendary because she kept going. And because she bested a raging dragon or ten and probably saved a civilization or two, but that was besides the point. She knew she had no one she was racing for either, so she had to race for herself. There'd be no real fanfare from a cheering section for her. Pinkie though, she'd probably cheer for her. Hawke chuckled to herself, the mare would probably cheer for everyone though and that was fine. She seemed sweet that way. The griffon sighed as she rushed along. Maybe she'd try next year, maybe then she'd be able to hold a position that felt better. This was fantastic! Everyone out here was giving it their all even after the struggles the race has thrown at them so far. It was just one of the many things the griffon enjoyed about the thrill of racing. Every creature in this refused to give up, win or lose! It was more than just helping the leaves fall, it was more than just aiming for victory. It was a chance to prove yourself to yourself. To show your friends and family your dedication. Everyone here had a different reason for running this race but that goal was the same. The finish line wasn't just and end to the race, it represented the culmination of everything that brought them here today. Maybe some where just in it for helping the leaves fall, maybe some were like Hawke and loved the thrill of speed. Whatever their reasons may be, they were united in the same purpose. To finish. Hawke turned her head again to Ra-Ra and nodded. "You've got this girl. I'll see you at the finish line. And don't forget what we talked about." she gave the mare a wink and sprinted off ahead back to the pack before she could get a chance to deny the twitterpated feelings that were surely in there somewhere. Hawke glanced off towards the finish line, it wouldn't be long now. She glanced around at her fellow racers, and at the stands filled with their friends and loved ones cheering them on, ready to congratulate them at the end. A pang of sadness passed through the griffon. Normally, it didn't bother her. She'd been away from home for a while now, no one even knew where she was. She wouldn't want her parents here even if they did. So she was used to not having a cheering section, but today. Today it stung a little as the realization sat in. She shook her head swiftly and sped up. She slowed down too much. Move faster, run harder, the feelings can't catch you if you keep moving. "No doubt from me dude. But with you puffing harder than a locomotive, it seems you're not as experienced in racing. That's okay though, no one starts out experienced in something." Hawke said with a nod to the unicorn. Oh yeah she could easily tell that he had experience with competition. That drive for victory at nearly any cost was readily apparent in his eyes...or maybe that was jaundice, were yellow eye-whites a normal thing for ponies? Proooobably not. But then again who knows? It certainly didn't seem normal for a pony to be able to pull out a cannon out of...wherever Pinkie pulled it out from, but she did anyway! Maybe just not question it, it'd make her brain hurt too much to think about it for too long. Mention of a party to Pinkie sat off a proverbial fire in the mare, hopping up excitedly at the mere mention. It made total sense too, with a cutie mark like hers, of course she loved to party! Cutie marks were interesting, though it sometimes made ponies predictable. Balloons? Parties. Wand? Magic. Their interests and talents often made clear their personalities, but sometimes the mark didn't always line up with that, but it was easier than dealing with other griffons. You can't always tell with a griffon which one's going to be the talkative one or the one more likely to bite your face than give you a time of day. Before the talk of parties could continue though, Pinkie rushed off again to help out Taira, seems his raccoon buddy was being a bit more of a pest than a pal. Speaking of helping out, the sound of some heavy laboured breathing had caught the griff's attention. Seems like Coloratura was reaching her breaking point. Taking a moment, Hawke would move and match pace with the mare and give a friendly smile. "Hey Ra-Ra! You're doing great, you're almost there! Just a little while longer now, you can do it. You heard what I told him right?" she motioned over towards the grey unicorn who STILL had yet to give her a name..."There's no losers in this race. You had fun right? Made some new friends? Bonded with an old one it looked like? That sounds like a winner in my book. And when you cross that finish line you'll feel it too. Just hang in there girl, you've got this!" "You don't need any help making yourself look good, Applejack, good luck!" Hawke answered with a smirk as Applejack rushed past her and the rest of the crowd. This was it! The last stretch of the race! Ponyville wasn't very far ahead now. Truth be told she didn't expect to catch up with either Taira or Applejack at this point. Not without her wings to give that extra boost. And as tempting as that was, she'd never forgive herself for that. It was one thing using them to save a friend, another entirely just to save face. It wasn't like Hawke hadn't ever came in second before, on the contrary, it's happened many times. Third even. Sometimes last. Fate was fickle like that. But even gunning for a tied second, Hawke was feeling like she had came in first several times over. That was the good thing about races like this. You make friends along the way, you bump heads in friendly competitive spirit, you help each other out. Speaking of friends and helping one another out "How you holding up? We're almost there! You can do it! Just a little longer now!" Hawke glanced over her shoulder at the grey stallion she'd been trying to cheer on. He didn't show it on his face, but something told her that all the guy really needed was someone to genuinely believe in him and encourage him. Or maybe she was just guessing. Who can say really? Next to her, Pinkie was still keeping pace like a champion as well. She was the biggest reason so far she felt like a winner. And maybe she was partialy why she wasn't just booking it ahead to the finish line as fast as she could. She as a distraction, in a really really good way. Swishing the honey pop in her mouth from one side to the other, she smiled over at the pink mare"And how're you holding up cutie? I don't want to neglect my cheering for you either! You've been doing fantastic. Given any thought about what we should do after the race. Or after the after party? I bet there's a killer after party." the griffoness gave her head a shake, letting some beads of sweat flick away from her feathers. She loved being in her element. Moving forward, no looking back. Forward momentum was the speed of freedom and it felt great. It was always nice to move faster than memories. Hawke chuckled at Taira's taunting. "Oh the view wouldn't be too bad if it weren't for the brick house in front of me." she countered with a grin. The beefy stallion certainly couldn't be considered a 'wide load' in the terms of being fat. But he was stocky and thick! And he certainly wasn't made of glass. Truthfully though the view wasn't bad at all!~ The griffon smiled over at the grey unicorn and snrked. "Eh don't let em get to ya. Winning the race ain't the only thing that matters. It's about having fun out here too. Making friends, enjoying the fresh autumn air, getting some grade A exercise!" of course the griffon was entirely unaware of the real depths of the rivalry between Taira and this unicorn...or exactly who this unicorn was yet exactly. "And you've certainly done all three of those so far! Made a friend with me and I ain't even got your name yet." Hawke winked at the unicorn, maybe that would be enough to get the mysterious and handsome stranger to give up his name. When Pinkie showed up the griffon grinned and waved happily at the mare "Hey Pinkie! Yeah, we'll catch up with them soon! I was just giving this guy here a pep talk." she said nodding towards the stallion. "He was getting a little winded there so I grabbed him a honey pop as a pick me up! I got you one too! A sweet for the sweet." the griffoness gave Pinkie a wink as she passed the pop over. "How're you feeling dude, think you can keep up with me and Pinkie over here? I betcha can! I believe in you!" giving the stallion a pat on the shoulder, she motioned forward. "Pump those legs, we've got this! There's no losers in this race!" Hawke pressed onward, making sure to keep an eye on the stallion. He seemed like a nice guy, she'd hate to see him strain himself too hard. Races were meant to be fun after all, maybe all he needed was some more friends...ones that he wasn't in a personal competition with that is. "Oh, okay Pinkie, I'll catch up here in just a minute!" Hawke said with a little wave as the mare zipped off to give Coloratura a helping hoof. That sap stuck rather fast, no wonder everyone was doing their best to avoid it! She was sure she could manage getting through it with no problem, but there was still the matter of paying for the free honey pops...Wait, did he say free? That's the best price! "Wow, awesome! Thanks a bunch! I'm going to grab one for me, Pinkie, and for...y'know I really should get that unicorn's name." she chuckled and shook her head, grabbing up three of the honey pops and popping one in her mouth. "Thanks again!" with a wave to the vendor, Hawke made quick work of catching up to the grey stallion first of all. "Hey dude, a pony that kinda looks like you was giving out free snacks. Cousin of yours? Anyway, I thought you might like to have one. A sweet healthy snack can help keep you going on long races like these." Hawke said with a friendly smile as she passed one of the other two honey pops over to the unicorn. "You're doing great so far. I can tell the length is getting to you, but hey, that's part of the fun right? Pushing those limits to see just how far you can go?" the griffoness looked on ahead for a moment. "Not far to go now I bet! Keep it up, you can do it!" everyone could use a little bit of friendly encouragement now and then! And even if Hawke had a bit of a competitive streak, it didn't mean she couldn't cheer on her competition! "Heheh, sorry Bevel, you just make it so easy!" Starlight replied with a giggle and a wink before turning her attention back to Bon Bon. "Well he's sort of my all around assistant I suppose. We made sure when we were discussing the details of the job that he has free time to model for Rarity though, I didn't want to take that away from him." the unicorn gave a nod as she paid for the second bag of candies. "He only started recently but he's been such a great help so far. So I figured a little treat couldn't hurt!" waggling the bag she waved to Bon Bon and made her way back towards where Bevel and Valen were seated. It seemed that nearby the spontaneously papering kirin from before was having a nice little conversation with Twilight. Rather than interrupt the conversation at hoof, Starlight gave a little wave the stallion as she took a seat between Bevel and Valen. "Here you go Valen, enjoy! Bon Bon makes some of the best candies around." She wanted to say that Sugarcube Corner had her beat on cakes and pies and whatnot, but Starlight bet she could hear someone say that from a mile away and be there with a sales pitch on why the bon bons couldn't be beat or something. Okay, so the rescue attempt didn't pan out exactly as they had anticipated. At the very least, they did manage to make sure that grey unicorn made it out safely, as well as a couple of stragglers who were more than a little bit lost in the underground's winding paths. So all in all, Hawke felt like it was a job well done! Now she could turn her focus back to the race! As they left behind the hills and dales and...was that something someone said about a bugbear? What the heck was a bugbear?...As they left behind that section of the race, Hawke couldn't help but to be impressed by the majesty of the Whitetail Woods yet again. Ponyville sure had some nice scenery!...Albeit sticky at the moment. Jeeze it was like the trees themselves were wanting to make things harder on everycreature. With a little shake of her head, Hawke kept her focus forward, doing her best to avoid any patches of sap. Something at the side of the raceway though caught her attention...Was that...Now how in the world did that unicorn get ahead of her? She glanced back over her shoulder to check...no...sure enough he was still back there. A twin? Whatever the case was, this one had a roadside stand with some snacks set up...surely a distraction! But the soft growl from her stomach wasn't having any of it. "Ugh...Hey, Pinkie! What do you think about a quick detour?" the griffon asked of her friend as she pointed up ahead at the Honey Pop stand. "I'm thinking a smackerel of honey might not hurt huh?" Hawke smirked at Taira, she could tell when a gaze was lingering too long. That's how she got away with it so easily, knowing when to glance away! Practice boys, practice. The griffon chuckled. "Well without the roll it's only half the fun!" she said repeating the process once again. This time however she decided to show off juuuust a touch, landing with one foreclaw on Taira's back as he galloped. "Or maybe you should head further down wind!" blowing a teasing raspberry at the kirin, Hawke spring boarded from his back and rolled down the next hill and hopped again up to the top to land next to Pinkie. "How was that for a trick?" she asked with a waggle of her brow. Though before the griffon could get Pinkie's opinion, the mare pointed out the sound of rumbling in the distance as being a tunnel collapse! "Yikes! Let's double time it over there! Taira, truce and detour? The exit for the underground's in a bad way apparently, and we could probably use your strong back, c'mon!" Not waiting for an answer, Hawke would rush ahead as quickly as she could towards the exit of the caverns. When she arrived she waved to Boulder Dash and sat about rushing to and fro to keep rubble clear from the exit. "Hey there, hope you don't mind a little help! I'm thinking that noggin of yours can only take so many knocks huh?" while Hawke wouldn't be able to crack any falling rocks, the ones that Boulder cracked or the ones he missed she could hurry and carry out of the way at the very least! Hawke chuckled softly at Taira's request as she and Pinkie started catching up to the kirin. As humorous as it was to imagine the bulky stallion attempting to leap as sprightly as Pinkie and herself, she couldn't imagine it ending well. "I hate to say it, Taira, but I think your antlers would probably get stuck in the hill mid-roll." Hawke answered teasingly as she lept and rolled and leapt to the next hill. Mid-leap she watched as Boulder Dash rolled past and THUNK, right on his noggin. The griffon allowed herself a laugh once she knew the rolling rock of a pony was alright. When Pinkie suggested that she show off some sweet moves, Hawke ran a claw through the feathers atop her head and laughed. "I think most of my sweet moves will have to wait until after the race." the griffon wiggled her wings beneath her binder and nodded her head towards them "Most of my moves require having these babies free, but I wouldn't mind giving you a show after we're all done." with a wink and another rolling leap, Hawke hopped up to the next hill. "We better hurry though! Let's not get caught in Hurricane Taira again!" Roundbottom Hills huh? She'd seen a few in her time. A few hills too. She mentally snickered to herself as she plodded along down the path next to Pinkie and their unicorn acquaitence. The area felt a good deal more scenic than the ravine they had left behind. A lot more safer too. Though the greatest challenge of this was the inclines and declines of the hills. Hitting a lot of those would leave a racer pretty worn out and winded. It seemed though that there were two paths to choose from! The upper path that wound through this hills and dales, and a second darker path of an underground forest. Only a few scant beams of light and the glisten of a few lamps could be spotted along that path, giving it a decidedly eerie vibe to it. As they drew closer onward, Pinkie explained how totally not scared she was of the dark. Which meant she totally was scared of the dark. It wasn't like Hawke could blame her though, it looked pretty creepy down there. She could handle it if she needed to, but did she really want to? Nah dude. But the hills seemed pretty exhausting if you're not careful about it. Pinkie's idea for bouncing over the hills though sounded...well silly, but probably kinda fun! "Heh, probably not as good as if I could use my wings, but I'm down for learning if you've got the time to teach." she replied to the mare's questioning, turning her own head to the stallion with them to ask if he could bounce with the best of them, but he was already veering off to the other path. "Good luck down there guy, watch out for bats and we'll see you on the other side!" as Hawke and Pinkie hurried off towards the hills she couldn't help but to sing "♪You take the high road and I'll take the low road, and I'll get to Fet Loch a'fore ye!~♫...You know that would have worked a lot better if we were taking the other path huh?" Hawke chuckled softly when Pinkie whispered to her, she gave a little shake of her head and whispered in return. "Ahh, he seems nice enough. Perhaps a bit overly competative with that friend of his, but I'm sure he has his reasons." she replied. Honestly she did find him a bit odd too, but who was she to judge? She didn't even really know the guy save for the passing conversation. A little friendly rivalry from the outside could seem strange to most anyone if it's strong enough. Before Hawke could reply to Pinkie's cute remark, the stallion called Boulder Dash rushed passed again, nearly knocking her off her paws as well. "Ch'yeah, more like a bulldozer." she said with a smirk. Their little trio wasn't too far from catching up with the lead pack. Normally Hawke would be able to better judge just who would tire out and who'd pull ahead in things like these. But the unfamiliar racers and the unfamiliar track left her with barely a clue. She didn't even know just how much longer the race would last. As they drew closer, Hawke was able to make out some of the mutterings about about 'love bug this' or 'losing focus that' "Sounds like some creatures out here are jealous. Ah well, I can't blame them too badly." Hawke said giving Pinkie another wink and a wag of her brow. Starlight chuckled and smiled and levitated the collection of stuff over by where Bevel was and sat it down gently. "Well if you're sure! You go ahead and take a seat and catch your breath, and I'll pick you up some bon bons. I think even Rarity would agree a little treat now and then won't hurt." she gave Valen a friendly wink before stepping back over to Bon Bon's booth to place a second order. The familiar, and exceedingly loud, voice of Yona's 'cheering' startled the unicorn into nearly dropping her bits. As expected the yak had a very impressive set of lungs on her. Before the mare's ringing ears could recover though, Bon Bon showed off her own set of pipes. Starlight had heard that going to concerts could risk damaging your hearing, but she didn't expect the stands of the Running of the Leaves to do the same. Maybe now though she could get her order in an-Nope, now there a new pony...er. Kirin on the scene...Where did he even come from? Nevermind, now was the chance to aaaand there was the loud ringing of Bevel's megaphone. Starlight was screaming internally but managed a smile as Bevel landed near by. "I think they can probably hear the cheering over in Canterlot, Bev." she teased, giving the inventor a kiss on the cheek before finally stepping forward to Bon-bon's booth again. "Hey Bon-bon, I'm getting another order of bon bons for my assistant, if you please?" Yup, today was definitely turning out to be a great day. A heart pumping race, new friends, and a date with a cute mare? The only way the day could get better is either winning the race or a ticket to a free full course meal. Hawke wasn't picky. The griffon was glad to see that the older unicorn hadn't lost his fighting spirit after that brush with the branches. A lot of ponies probably would have just sat it out after that, but this guy had guts!...Or was just a little off in the head and REALLY desperate to beat his friend. Whatever the case may be the company was welcome and the trio was off and dashing through the woods again. She listened in as Pinkie and the stallion talked about the unicorn's animal companion. That explained the raccoon she saw on Taira earlier, she thought it an odd fashion statement. When he brought up needing a better plan to catch up to Taira, Hawke chuckled and lightly shook her head. "Well maybe if you had a cat instead of a raccoon your last try would have worked better. They guy has the craziest allergies I've ever seen. Next time I get ahead of him, I'm gonna have to play it careful or I'll be taking another impromptu flight."